I read a considerable number of cosmology and physics books written mostly for the general public. Perhaps a better phrase is books written for “general consumption,” as I’m not sure how many people would really enjoy reading “Black Holes and Time Warps: Einstein’s Outrageous Legacy ” (Kip Thorne) or “The Tao of Physics: An Exploration of the Parallels between Modern Physics and Eastern Mysticism ” (Fritjof Capra). I would like to think I belong to relatively exclusive and esoteric club of readers who have turned cosmology into a sort of odd fetish. By the number of people on GoodReads who also share my interest, I am somewhat chagrined by size of the interest group, though I’m sure the authors are exuberant. On the other hand, society needs more people diving into the science domain to counteract what seems to be the anti-science, anti-intellectual, pro-religion rhetoric seeking to infect and damage STEM education in the United States. So, while personally I might like to think I belong to a small group with a peculiar attraction to cosmology, science has nothing to gain, and society has nothing to gain, from being peculiar. Admittedly, I need a larger collection of books, in general, and more science books, specifically. 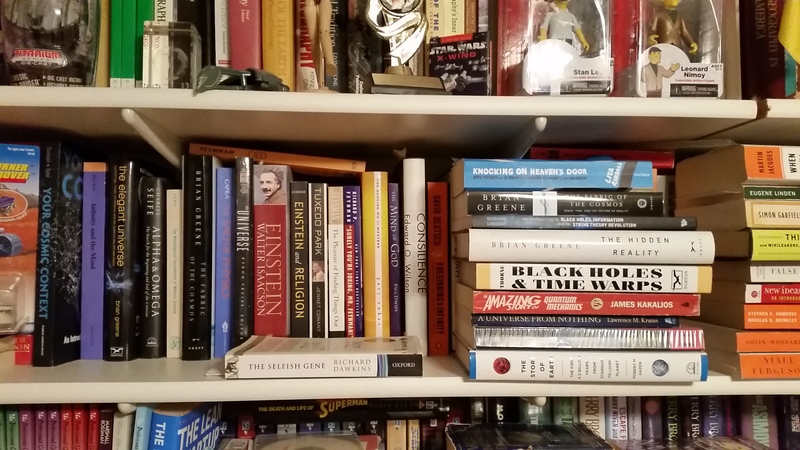 Not included in the image above are books associated with economics, history, or geopolitics, nor any of the fiction I tend to read in-between reading non-fiction, or the books I’ve read throughout my earlier years I have evidently divested myself of, unfortunately. I thought I would present the books I have studied as a sort of resume for reading and writing about science and history, offer some suggestions for reading, and am completely open to more suggestions. Some of my books are not pictured, as they are still in my To-Read stack, like The Road to Reality: A Complete Guide to the Laws of the Universe by Roger Penrose, and An Introduction To Black Holes, Information And The String Theory Revolution: The Holographic Universe by Leonard Susskind. I am a big proponent of the free iTunesU courses available through iTunes. When working on maps, projects, grading, re-purposing old computers or keeping new computers running, I will keep a podcast or iTunesU course playing in the background. Like right now, I’m listening to “Rationally Speaking #101” featuring Max Tegmark. Dr. Tegmark has a book, Our Mathematical Universe: My Quest for the Ultimate Nature of Reality.” Dr. Tegmark has evidently already talked himself out of at least one of the ideas he presents in his book, according to his comments during the February 9th, 2014 interview, and the book was published only in January 2014. Your Cosmic Context: An Introduction to Modern Cosmology, by Todd Duncan and Craig Tyler. This is a college textbook, and a good one. If you are really interested in a subject, survey the syllabi of classes related to the topic. See what textbook is used, or look for a reading list. This is what I do. My university has few people, (one, I think), who know something about cosmology, so my resource pool is pretty shallow. Many faculty will post their syllabus online for curious people like me (and you) to find and study. Examining other syllabi is also a good way to check yourself if you happen to teach the same or similar course, by the way. Infinity and the Mind: The Science and Philosophy of the Infinite (Princeton Science Library), by Rudy Rucker. Some theories border on the metaphysical, the religious, the sublime, or as some suggest, the ridiculous. Quantum entanglement, “spooky action at a distance,” the ability of particles to effect each other across Space, maybe even Time, is a concept few are capable of rationalizing. What came before the Big Bang? and, What is the Universe expanding into? And, are there other dimensions? These are questions which may have no hard answers. But, who is to say our understanding of our universe won’t be radically altered tomorrow, or next week, or in 50 years? Merely because we have no solid answers today doesn’t mean we won’t have solid answers at some time in the future. No one can say that, but thought-experiments are necessary to direct real research, ask real questions, and see if we can’t inch closer to a better understanding of our environment, if only by baby-steps. The Hidden Reality: Parallel Universes and the Deep Laws of the Cosmos, by Brian Greene. I’m hoping Brian’s next book is called, “The Elegant Fabric of Reality,” and our universe is simply one strand on the Universe’s Multiloom. Einstein and Religion, by Max Jammer. The best characterization anyone can attribute to Einstein about his religious leanings would be to classify him as “agnostic.” He was always evasive about his religious leanings, and in my opinion, this had more to do with him finding those discussions leading nowhere, and intrinsically boring. I believe he felt more important topics deserved more attention, such as the nature of gravity. Did Einstein believe in God? No, I don’t believe he personally believed in a god. I don’t think he would support intelligent design, either. Tuxedo Park, by Jennet Conant *favorite. What a great book of history this is. I watched Jennet Conant discuss her research on BookTV (C-Span) and was enthralled, bought the book based on her conversation. The Dismay of Finding Out Feynman Was a Horribly Sexist D-head, by Me. Richard has passed away, so you can safely buy his book without supporting huge sexist pig.We also don’t want to toss the baby out with the bath water, either. Knocking on Heaven’s Door, by Lisa Randall *favorite [See my review] If you buy any book in this list, by this one. The best discussion of the Large Hadron Collider of any book, plus particle physics with cosmology. A great book for the general public. An Introduction To Black Holes, Information And The String Theory Revolution: The Holographic Universe by Leonard Susskind. I did not review this book. I bought the book specifically for the math behind black holes; I wanted to see what the math looked like. Yep, there’s math, right there on the pages. And, now I moved on. Don’t buy this book unless you positively must see what the math of black holes looks like. And this is an introductory text. The Story of Earth, by Robert Hazen *favorite [Read my review] If you believe in a “young Earth,” an Earth with a biblical age and not an age grounded in science, you won’t like this book. So, you should really read this book. In the 21st century, we can’t go around clinging to fables written by unsophisticated people 2,000 years ago who were trying to explain events and circumstances by attributing them to gods and goddesses. No one is saying the messages of peace, acceptance, and respect should be tossed away, just don’t use any religious tome as a book of science. To close out my post I pass along word I ordered Max Tegmark’s, “Our Mathematical Universe,” mere moments ago. This post has been fermenting in my WordPress draft folder for many months and I forgot to order Tegmark’s book after having read Randall’s Knocking on Heaven’s Door. Tegmark’s name gets mentioned constantly when cosmology is discussed, so it is about time I read the consumable portion of his endeavors. To this reading list I may add Stanley Salthe’s Evolving Hierarchical Systems once I slog my way through. In my review of the Hyperion Cantos I mentioned I ordered Salthe’s book, being part of the scientific foundation of Simmon’s Cantos. I have to allow my brain to rest after reading these books much like weight-lifters must allow their muscles time to recover. PAX.